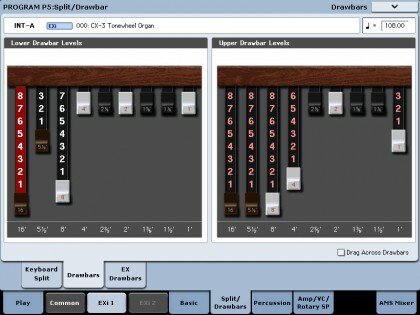 When you switch program sounds during a performance to get ready for the next section, or when you switch from Program mode to Combi mode, the sound that’s currently being output is always given priority and its effects are maintained during the program change, ensuring a seamless transition with no dropouts. This function has also earned extremely high praise from pro musicians. 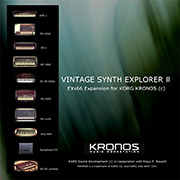 KRONOS harnesses nine distinct synthesizer/sound engines into a single, integrated musical instrument. Dynamic voice allocation and new technologies allow all sound engines to smoothly share a stable, enhanced hardware platform. The results are nothing less than spectacular. Choose your piano! 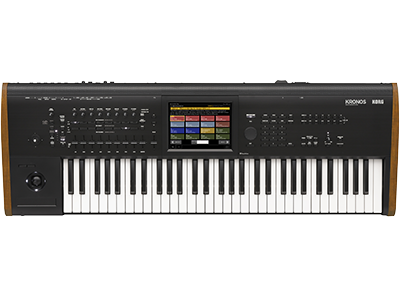 In addition to the acclaimed German Grand and Japanese Grand provided in the SGX-1 engine, the enhanced KRONOS SGX-2 Premium Piano now includes the distinctive Berlin Grand. 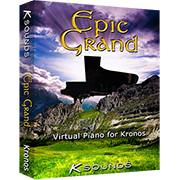 By adding the EXs12 Austrian Grand option (sold separately), KRONOS can offer access to the greatest names in the grand piano world. Un-looped stereo samples recorded for every key provide a natural, authentic decay. 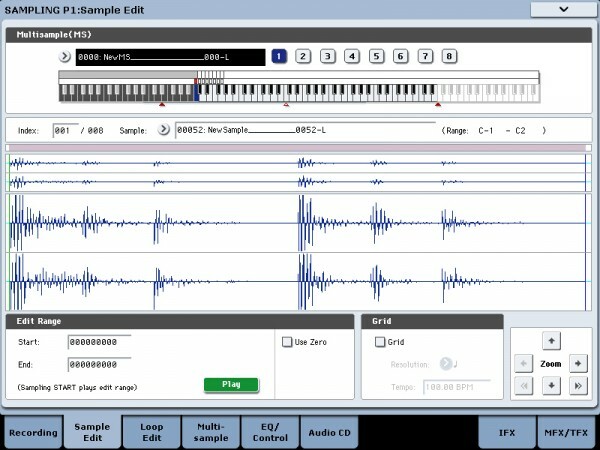 Improved 12-level velocity switching exceeds the previous 8-level data, and features such as nuanced extras as pedal string resonance and una corda sample data to recreate every detail of a grand piano performance. 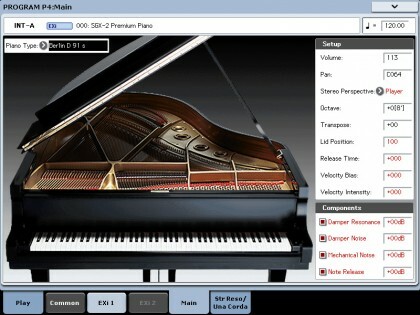 With the damper pedal depressed, all of the piano strings are free to resonate. When any key is played on the piano, other strings that are pitch-related to the original key may begin to vibrate via sympathetic resonance. The SGX-2 accurately captures and recreates this sympathetic string resonance, adding an additional level of detail to the grand piano sound. 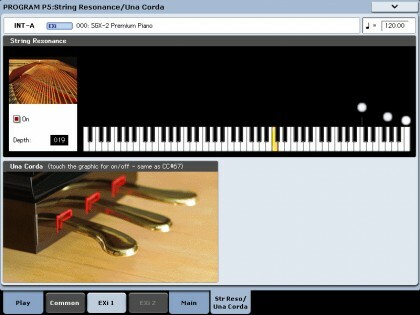 * String resonance overtones can be viewed in the string length edit screen. The pedal to the far left on a grand piano is the soft pedal. The technical name for this pedal is una corda. Una corda translates literally as “one string.” Normally, the piano hammer strikes all of the strings tuned to a particular note, usually three or two. Pressing the Soft/Una Corda pedal shifts the entire piano action, so that the hammer hits only one string. The resulting sound is lower in volume, and has a more muted tone. The SGX-2 Piano Engine contains new una corda samples that can replicate this subtle shift in volume and tone to provide a faithful piano performance, complete with all pedal actions. 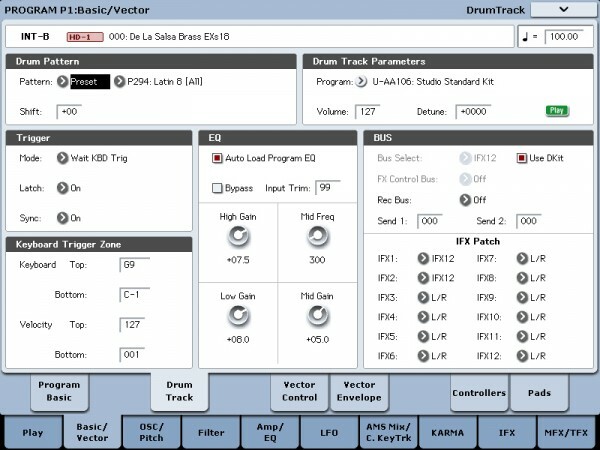 *Una corda settings can be specified for the foot pedal (separately sold option) and in the screen. 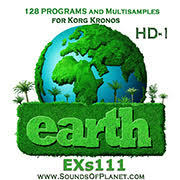 The KRONOS EP-1 sound engine is dedicated to faithfully recreating six of the most popular classic electric pianos. 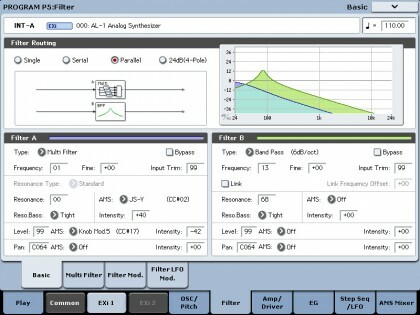 The MDS (Multi-Dimensional Synthesis) technology eliminates the transitions between velocity-switched samples, and does away with the unnatural behavior of looped samples. 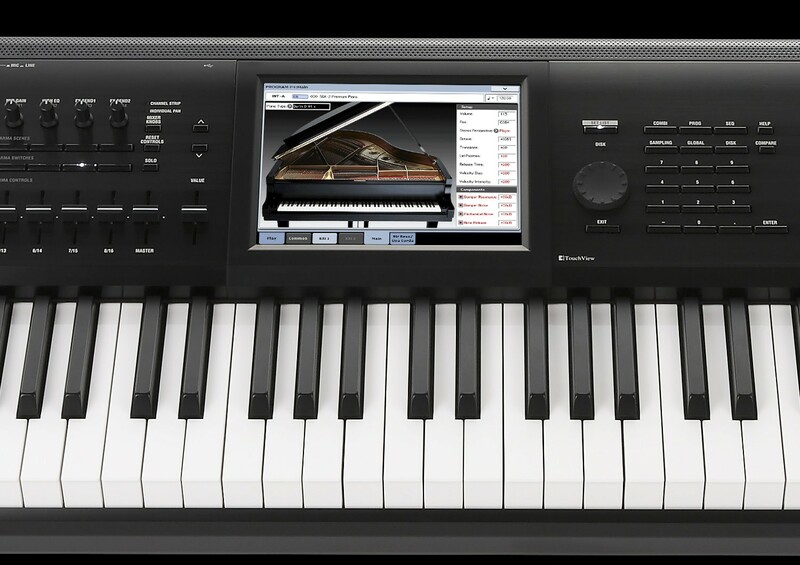 Smoothly responding to the nuances of the player’s touch, yet allowing your performance to reach an energetic climax, this modelled engine features an astounding dynamic range that exceeds what one might expect from digital sound generation. For each of the six different models, different amps, cabinets, speakers, and standard vintage effects are realistically simulated. 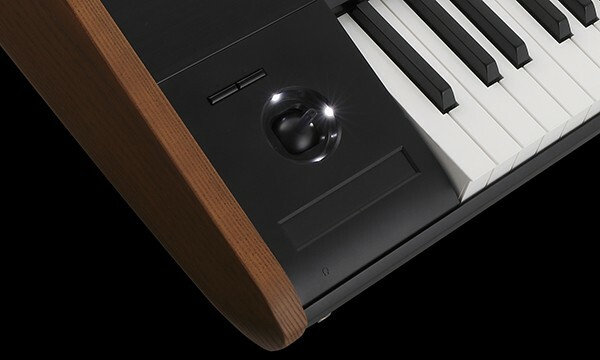 From the samples to the touch and the effects, all aspects affecting the sound are coordinated into a single package, making this the ultimate electric piano. 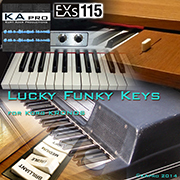 The original KORG CX-3 combo organ went on sale in 1980. Loved by musicians around the world, this classic organ reappeared in 2000 as a new product with the same name, but using the latest technology. In KRONOS, the CX-3 engine precisely models this classic tonewheel instrument. 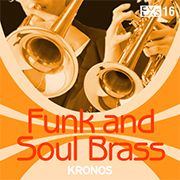 Proprietary KORG technology has been used to perfectly reproduce the vacuum tube amp, and effects such as Vibrato/Chorus. Special attention was given to the rotary speaker effect, which lets you choose from seven types, as well as use the KRONOS’ joystick in the X-axis to control the speed. 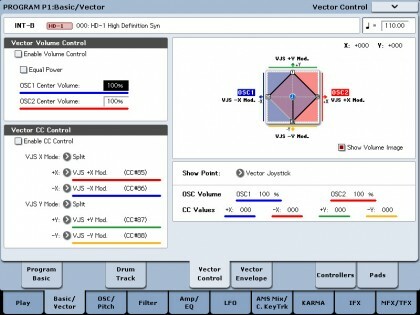 Even the instability, fold-back, leakage, and noise of the tonewheels have been obsessively analyzed and recreated. The organ sounds heard in legendary performances—some recreated here by the original artists—are now yours for the playing. 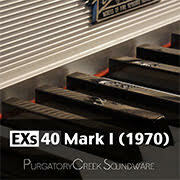 Experience these classic organ sounds, reborn for the present day. 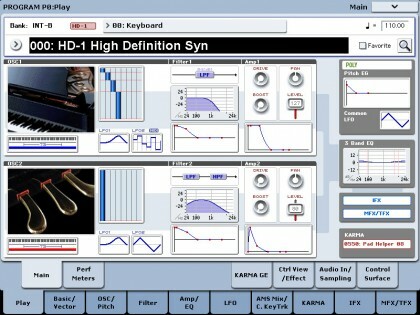 HD stands for “High Definition” indicating the HD-1’s superior sound, starting with KORG’s proprietary low-aliasing sample playback oscillators, full-bandwidth multimode resonant filters, and extraordinarily fast & smooth envelopes and LFOs. The HD-1 is the most powerful PCM sound engine in KORG’s history, into which KORG has poured all the PCM know-how accumulated since the M1. 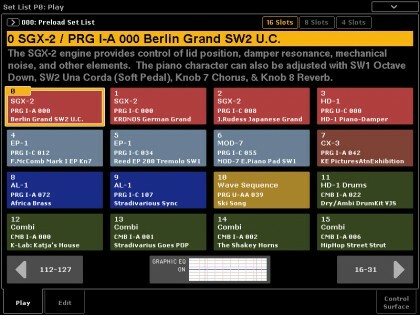 All of KORG’s acclaimed PCM sounds are painstakingly created by specialized technicians. 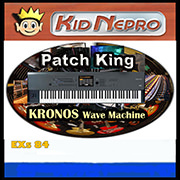 Data that was reluctantly omitted from previous models due to limited memory has now been called back into service on the KRONOS. 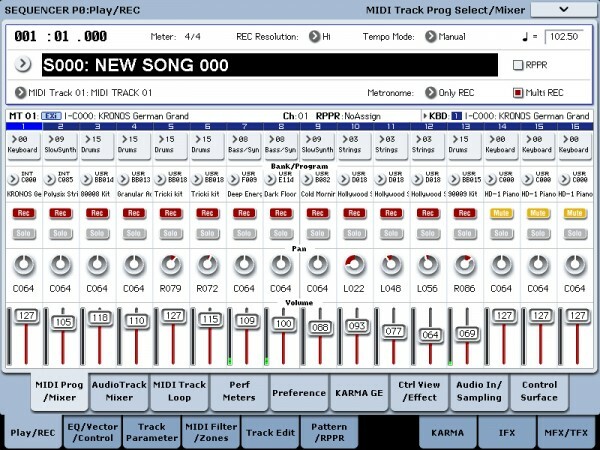 The amount of waveform memory alone might rival a PC-based sound engine. 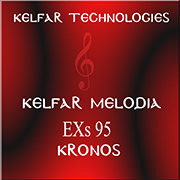 Yet the real difference is in the completely different level of quality and finish that is obvious when you play these sounds as instruments on the KRONOS. The finest technicians, working on the finest platform, and aiming at the finest quality: that’s the HD-1. 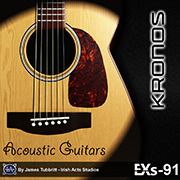 Packed with cutting-edge technology, KRONOS nonetheless has respect for the classics. The KORG MS-20 first appeared in 1978 and quickly captivated many synth fans with its rich personality marked by thick and solid sound, aggressive filters, and patching capability that provided nearly infinite possibilities for creating sound. 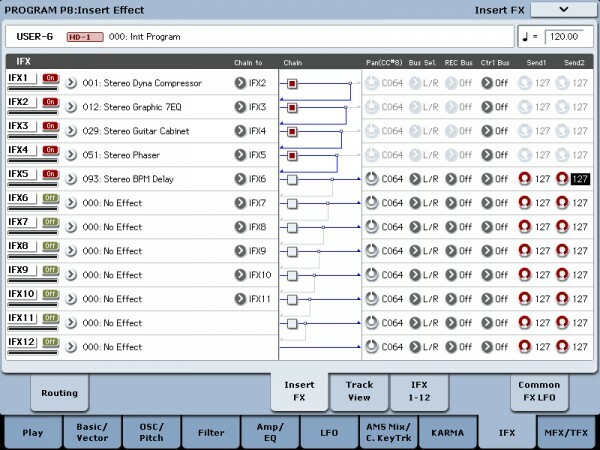 Using KORG’s CMT (Component Modeling Technology) the MS-20EX faithfully reproduces the MS-20 while dramatically expanding its patch panel functionality. 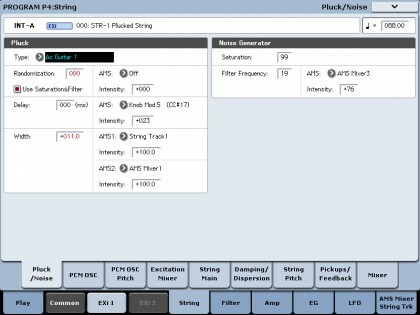 Modulate filters with audio-rate oscillators; turn audio inputs into control signals; control all of the original knobs with mod sources including additional envelopes, LFOs, and real-time controllers. It’s a tweaker’s dream. 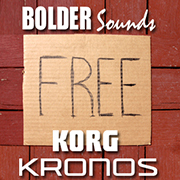 And of course, the KRONOS version is now majorly polyphonic. The Polysix first appeared in 1981, offering six-voice polyphony and program memory, and a surprisingly competitive price tag. 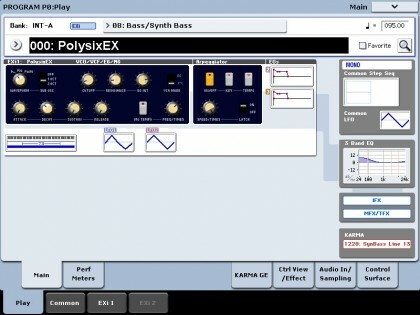 With its self-oscillating four-pole filter, smooth analog oscillator and sub-oscillator, plus a lush Chorus/Ensemble effect, the PolysixEX extends the abilities of the original in many creative ways. The strings and pads that were such a major feature of the Polysix will be invaluable when you need the sounds of the early ’80s. 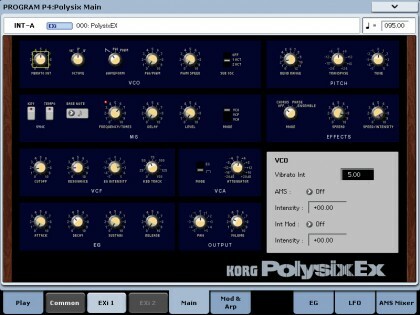 The classic arpeggiator built into the original Polysix is also provided. As a bonus, it’s also capable of extremely high polyphony. 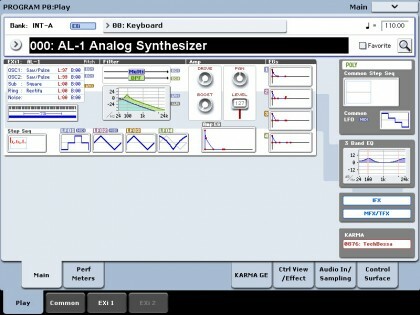 Feature-packed, the AL-1 is the same premium analog modeling sound engine that was first featured on the KORG OASYS, the Open Architecture Synthesis Studio back in 2005. 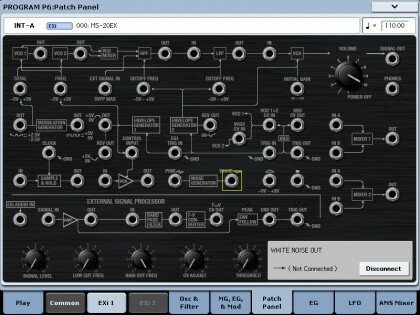 Completely eliminating aliasing noise, and delivering the supple and fascinating sound of analog synthesis, this sound engine uses oscillator waveforms and filter morphing to generate new sounds that were unobtainable for analog synthesizers of the past. 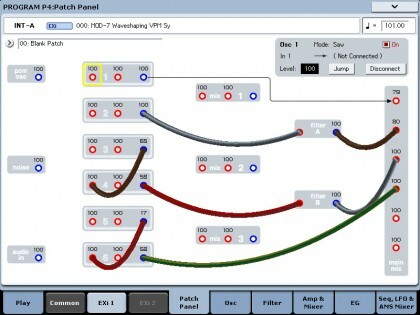 This sound engine uses VPM synthesis based on the VPM (Variable Phase Modulation) technology that powered two classic instruments, the Prophecy which appeared in 1995 and the Z1 which appeared in 1997 as a further evolution, and adds PCM sample playback, multi-mode filters, and external input to create a freely patchable semi-modular synthesizer. 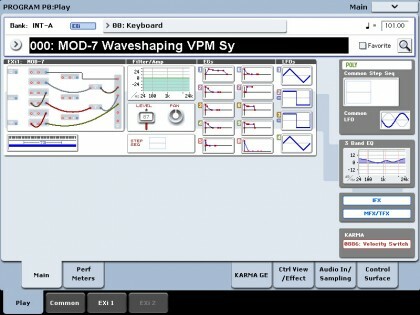 Combine Variable Phase Modulation (VPM) from KORG’s classic Prohpecy and Z1, add in some wave-shaping, a little ring modulation, mix in a few samples, and add subtractive synthesis, plus a modular patch-panel system, and you have the MOD-7. 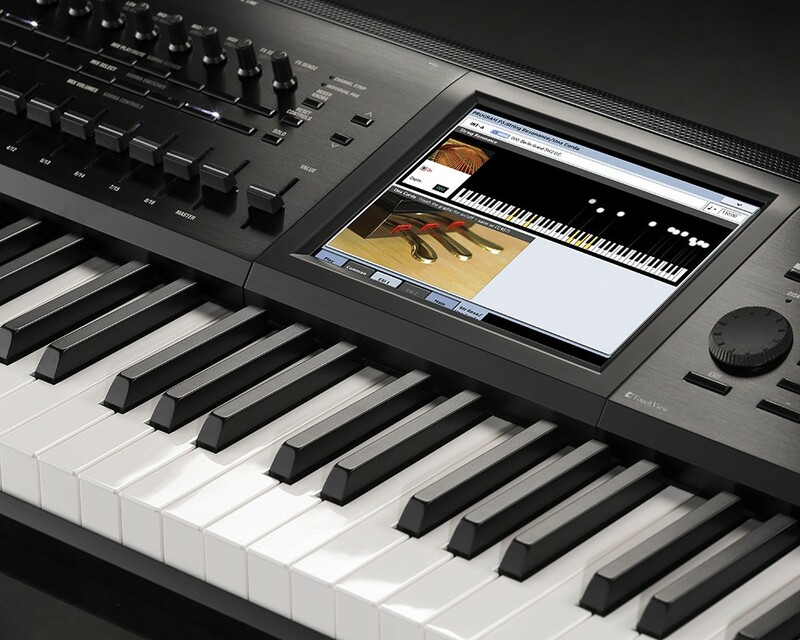 Exceptionally versatile, it offers everything from classic FM keyboards, bells and basses (including the ability to import sounds from vintage DX synths) to rhythmic soundscapes and sparkling, epic pads. 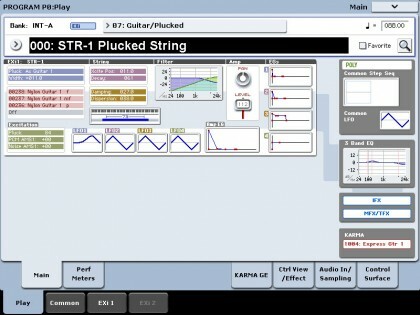 Based on the physical modeling know-how KORG developed over the course of many years, this struck/plucked-string physical modeling sound engine takes advantage of cutting-edge technology. 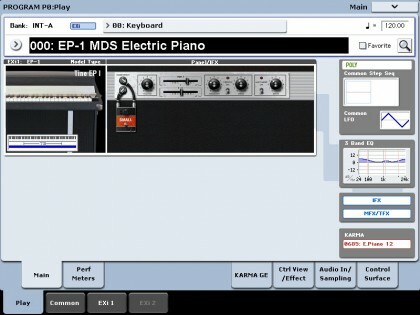 This sound engine shines at producing sounds whose tone responds to your touch in ways that are difficult for a PCM sound engine to reproduce: acoustic guitar, electric guitar, harpsichord, clavinet, harp, bell, as well as ethnic instruments. 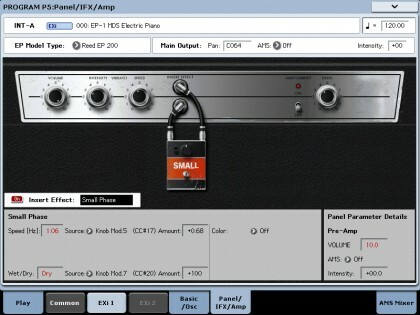 It also goes much further, allowing you to synthesize and modify sounds that do not exist in reality. 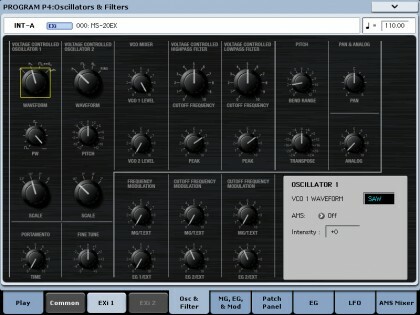 This is a sound engine of the future, one that allows the synthesizer programmer to construct truly new sounds.